First two chapters of my novel; Hope Bats Last – a motorcycle mystery, among other things. Hope you enjoy this. If you do let me know and I’ll keep posting chapters! It’s available on Amazon. You start the game with a full pot of luck and an empty pot of experience. The objective is to fill the pot of experience before you empty the pot of luck. This is a work of fiction. In the summer of 2014, I did take a cross- country motorcycle trip along the route described in this novel and I kept a diary of the experience. 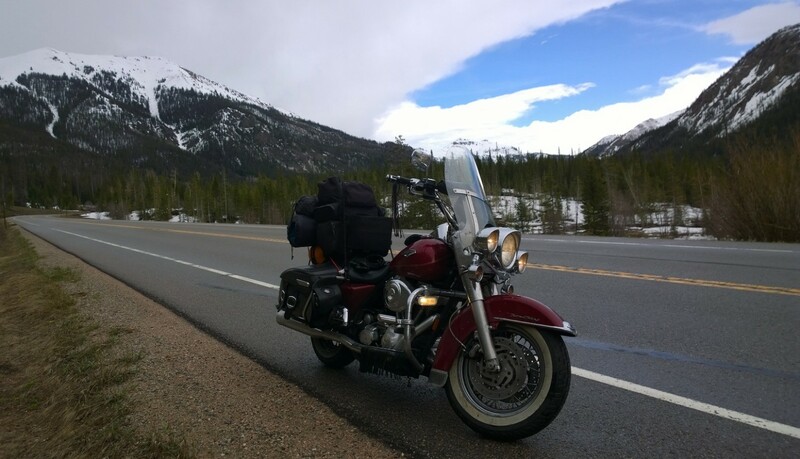 I wanted the story you’re about to read to feel as real as possible and so much of what happens is inspired by events from that ride and other motorcycle trips I’ve taken. I’ve had a great deal of fun writing the book and I hope that you feel like you’re riding along with me. However, I want to make it clear that the key events that are described as occurring in Chadron and O’Neil, Nebraska and Osceola, Iowa are entirely fictional. For example, I understand there is a Harley Davidson dealer in Osceola but I’ve never had any contact with it. Similarly, there’s a social services agency in Osceola but the events described did not occur there and are instead inspired by my previous work as a social worker. Sadly, there is also no Lancelot dinner, but I really wish there was. I hope you enjoy the ride and the story. Kickstands up. One of my favorite writers, Anne Lamott, uses the expression “Grace Bats Last”. I modified this, for reasons which I hope will become apparent to you as you read the story. The expression “bats last” comes from the American sport baseball. In a baseball match, each team gets a chance to bat and to drive in runs, which are like goals in soccer. The home team always gets to bat last, thus having the opportunity to score and rise from impending defeat. Grace does get us to our most difficult struggles in life, but it is through moving forward in hope that we get through them. The soft rays of dawn drift and dip in the wake of the tugboat chugging up the Savannah River while I wait for my son to try one last time to talk me out of riding my Harley across the country. He’s always been a bit overprotective. Can’t say I blame him. He’s had three mothers of his die. Two of them were my wives. His heart has been broken so many times that I’d swear I can sometimes hear God whispering: now where does this piece go? My son has a wife and a child, and a sister, my daughter Hannah, in California but it’s still hard for him to let me go. Hard for me to leave. But I’m retired now and may not have that many trips left in me. And when that tiny voice inside you insists you leave then it’s time to pack the saddlebags and put the kickstand up. Still, though I know I have to go, I’ve got enough tears welling up in me that could cause this river to flood its banks. Folks say that growing old isn’t for sissies. Lemme tell you, growing old is easy, it’s grief that ain’t for sissies. “Who cares about that?” I replied as I slowly opened my left hand where I’d written the answers. He always asks me stuff about yesterday. He paused and stared at me. “Daaad,” he whined, just like when he was a little boy. I put my arm on his shoulder and pulled him close for a hug. I held him until he pulled away. That’s the way we always did it. A dad should never end hugs first. “Naw. Just joking with you. I mean I do have them but I’m carrying the Taurus PT 24/7 and ammo with me in the saddlebag.” I patted one of the black leather bags just to reassure him. At least I think it was in that one. “Let me hug you, son, one more time before I go,” I said, and we embraced. This time I wouldn’t let go when he tried to pull away. “I’ll be all right son. You take care of Siobhan and Stephen.” The tears started flooding out. “I love you, Colin.” I blubbered. “God protect and bless you and your family.” There’s never any more to say after you’ve said that. I squeezed him hard and let go. I watched as Colin walked away and drove off. I shook my head. He was a great son, a good brother to his younger sister Hannah and, from what I could reckon, a loving husband and father. He just worried too much. If he didn’t have enough of his own he’d borrow worry from others. His shoulders were slightly curved, a feature he’d had since childhood. It somehow helped him bear the pain he’d experienced in those early years, the psychic weight of all the emotions, the hurt and sadness, which when we spoke of them we just called “hadness”. The curved shoulders were like body armor, a somatic and psychic defense against the lifelong family traumas he believed would continue to strike him. He wasn’t far from wrong on that. A policeman came walking up the cobblestone street and signaled for me to move the bike. I waved at him, checked the neutral light and cranked up the Harley. He came over to the bike and tilted his head side-wise at me. He took off his hat as if thinking that would somehow help me remember him, but I didn’t. I just stared. I did sort of remember a McMillan from my years on the force before I left to become a child protection worker. He scanned the area. “Whatever.” He said dismissively and tapped the bike handle. “You be careful out there. Keep the shiny side up!” He added as he walked away. Mary Fitzpatrick. I shook my head and let out a long sigh. God almighty, what can I say about her? When I was a rookie about forty years ago and she was a child I removed her from her abusive mother and put her in foster care. Years later, when she was grown, had kids of her own and was addicted to crack I end up removing her kids. That removal hadn’t gone well. My job that day had only been to protect Karen, the social worker, ensure her safety and that of the kids. But I hadn’t been observant enough. Mary’s paramour suddenly appeared with a gun and shot and killed Karen. I remember her last scream, her mouth contorted like the one in Munch’s painting. Echoes of her scream are still there inside of me, in a quieter place, but I can still hear them. I tackled Mary’s boyfriend and ended up throwing us both off the third-floor balcony. He grasped my shirt as we dropped. I remember us hitting the ground, his body arched unnaturally beneath me, having broken my fall. He was dead; his eyes wide in fear, his arms around me like a scared little brother’s. Before I passed out I heard the sudden peaceful silence and the siren song of a distant ice cream truck. I quit the force then, the first time, left Savannah and ended up somehow in Ireland for a few years, again working for the police. Then I moved home here and worked as a detective again. I used to go around and see Mary and her family every week but she never stopped hating me, blaming me for removing her from her mother, from removing her own children from her, somehow landing her in the dismal life she was now in. There was some justice in that. The last time I saw Mary was about 20 years ago when I had been working as a detective again for a while. It was a rainy, overcast and muddy night and I stumbled upon her body in a ditch just across the river over there on Hutchinson’s Island. She was half covered in moss and mud with her face caved in, unrecognizable except for the silver necklace with the word “Hope” on it I had given to her sometime earlier. I couldn’t take it anymore. After that night I quit the force again and wandered like a lost Ishmael around the country for a while until a buddy convinced me to try child protection work. I did that until I retired. And thank God not a child died on my shift. “We ain’t got all day!” I heard someone shout. It was McMillan about a hundred yards away. I waved, put the kickstand up and rode across the brick and onto the old cobblestone of River Street. It was an act of penance to ride this bumpy road. If life hadn’t shaken the hell out of you by this point in your existence, then this road would do it. I climbed a branch of the road up to Bay Street and headed west toward the bridge to South Carolina. As I rode across the high bridge I felt the wind on my face, carrying the scent of the ocean which was just a few miles away. It’s May here, and Savannah is blooming with camellias, hibiscus, and magnolias. A rich, earthy scent pervades and promises hope, renewal. Below me now was the copper-colored Savannah River, tugboats pulling foreign named container ships, and the swishing avocado green, ochre, and golden marsh grass. If you ask me there have been too many metaphors with bridges in them. Bridges are just ways of getting you from one place to another. They’re nothing magical. When you cross a bridge you’re still the same person you always were. Sure, you’re in a new place, sometimes a better place. Not that I’m saying South Carolina is a better place, not saying it isn’t. But it doesn’t matter because the old self is still there, just a stowaway which you’ve trundled along into the new world. There are no bridges, no shortcuts, to anywhere worth going. There’s only the road. I rode onto Hutchinson’s island, a small interstice between the Savannah River and the Back River. Once there were rice plantations here, built and managed on the backs of slaves. But the place was always cursed. Two hurricanes flooded the island killing slaves and pilling boats up on the foot of the bluff. Then yellow fever swept through the area. While Sherman was marching into Savannah during the American Civil War, Confederate General Hardee under the cover of darkness was escaping through here with his men. Later, Hutchison Island became a dumping ground for waste and murder victims. Now it carries a fancy hotel, convention center, and golf course. Life moves on. Riding farther I passed bottomland hardwoods, marshes, swamps, and wetlands where gators roam and the remnants of the old levees and dikes are still visible. My bike is called “Big Red”. She’s a 2004 Harley Davidson Road King Classic with a 95 cubic inch engine and she weighs about 750 pounds naked, right out of the shower. But she’s also loaded up with my tent, sleeping bag, and ground pad and her black leather saddlebags carry my supplies and tools. Behind me, velcroed to my seat I’ve got a big charcoal colored bag carrying my clothes, medicines and sundry items. The whole shebang is strapped down with bungee cords. Even with all this weight, she can easily cruise at 80 mph with still plenty of throttle left in her. I once got her up to 102 mph on a back road in Missouri before the front end began to shimmy. We were both younger then. Also attached to the bike are a few items to help keep my mind and my soul in the right place as I ride. Hooked onto one of my windscreen bags I’ve got a green Connemara marble penal rosary. An Paidrin Beag. It’s a small eleven bead rosary with a cross at one end and a ring for your finger at the other. Catholicism was banned for a while in Ireland and praying the rosary could get you thrown in jail or worse. This rosary was so small that it could be easily hidden in a pocket or under some clothing, so the person could pray without being detected. The rosary is there to remind me to be openly reverent on the trip. Wrapped around the handlebar I’ve got a leather bracelet with a pewter Yin Yang symbol from Taoism on it. Stay in the here and now. Trust your journey, it says to me. Stay balanced. Finally, I’ve got a hula girl where my clock used to be. She dances around and reminds me to be silly, to not take myself too seriously. My road name is “Monk”. There’s a long story behind that but we’ll leave it for another time. Right now, I’ve got to concentrate on the road. It’s a two-lane highway that doesn’t get much use. There are plenty of road gators, bits of tire and metal, cowering mostly on the edge of the road, and a few potholes and tar snakes. The wind’s beginning to gust, blowing out of the northeast. Grayish-purple thunderclouds are gathering in the distance toward Bluffton, a veil of rain filling the sky. A good enough omen to cause me to head due west.